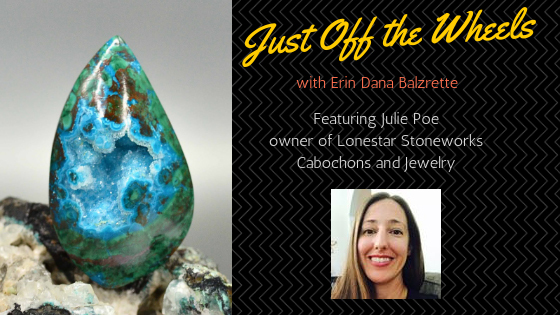 A fellow Texan and wonderful lapidary artist, Julie Poe's work is an eclectic mix of artistry. Using different textures, and unique freeform shapes, her work helps us see the stones in a new and beautiful way. It was wonderful chatting with, and learning more about Julie Poe, for this installment of Just Off the Wheels. 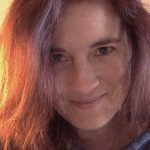 Erin Dana Balzrette: Where is this material from, and what drew you to it? Julie Poe: This is Parrot Wing Chrysocolla from Australia. What drew me to this particular piece was the large beautiful pocket of blue botryoidal druzy, sitting in plain sight. This type of material is eye-catching, with colors that are contrasting and vibrant, and it takes a fantastic shine. JP: I was lucky to have a grandfather and an aunt who showed me, while I was growing up, the beauty that could be found in seemingly dull rocks. My first interest in pursuing rockhounding came many years later during a trip to Las Vegas. While planning my trip, a friend mentioned there was a turquoise mine that would let you come and do fee digs in Nevada. In the end, I halfway dragged three other people across the Nevada desert, far from the city lights, and had the time of my life collecting turquoise. They had just hit a good vein at the mine, and we ended up with some very nice pieces. I could not leave this beautiful material as rough. At that point, I decided to try my own hand at cabbing and I haven’t looked back since. EDB: What creative process do you use when creating cabs? Is there any special technique used when creating the ones featured today? JP: Whatever happens to catch my eye on any given day is what I cab. It’s a very “go with the flow” approach, which is quite a contrast to how I usually approach things. I might look at a slab or rock for months and not pick it up. Then, one day I see something about it I hadn’t noticed before and I just have to cab it. The fun thing about creating this particular cab was figuring out how to cut the end piece to keep that wonderful druzy pocket intact and usable for cabbing. JP: I am currently enjoying cabbing through rough end cuts. Until now, I had largely stuck to slabbing everything on both sides before cabbing it. The end pieces sometimes have little pockets of the very nicest part of the rock, though. I have started cutting the end pieces with that in mind and cabbing straight through the rough side to see what beauty lies underneath. JP: Do some research and start with the right equipment. It can be a little bit of an investment to get into doing your own lapidary work. Having a cabbing machine that can keep up with how you intend to use it will keep you from getting unnecessarily frustrated with the process and giving up. JP: For me, it’s all about the “diamond in the rough” aspect. It is a joy to see something beautiful through the rough exterior and to frame it and polish it in such a way that showcases the little, hidden treasure that nature gave us. My favorite part of the process is deciding how to cut each rock and laying out the cab designs on the slabs.